Considered to be the most advanced non-surgical facial toning procedure available today. 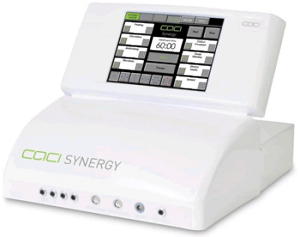 Caci has become know as the non-surgical facelift. CACI gently helps tighten and tone sagging muscles whilst smoothing the appearance of lines and wrinkles. This is perfect for clients who want an intense version of the 1 hour signature Non-Surgical Face lift for enhanced results. It gives an extra 15 minutes to concentrate on areas of muscle laxity, aimes at mature skin types those with specific concerns. This facial introduces our breakthrough S.P.E.D microcurrent LED technology which uses light therapy to enhance results providing the very best in Caci Non-Surgical facial toning. Ultrasonic peeling and orbital microdermabration are used to exfoliate leaving a brighter, smoother complexion. Microcurrent impulses combined with LED light therapy will then lift and tone the face and neck, followed by Caci’s unique wrinkle comb to target fine lines and wrinkles. This 30 minute facial treatment helps to improve the appearance of sagging jowls by using the quad probes which have been specifically developed to target the muscles around the jawline. The quad probes emit tiny electrical impulses to lift, firm and redefine facial contours. The gentle 30 minute treatment soothes tired, puffy eyes, combats dark circles, reduces fine lines and wrinkles and lifts hooded eyes. The treatment uses serum filled CACI microcurrent eye rollers which have a cooling effect on the skin to gently tighten and tone sagging muscles around the eye area, whilst reducing the appearance of fine lines and wrinkles. The Synergy Radiance rejuvenation treatment uses controlled orbital microdermabration to exfoliate and deeply cleanse the skin, leaving a brighter, smoother complexion. Caci’s unique Wrinkle Comb will then target fine lines and wrinkles providing a non-invasive alternative to collagen injections with LED light therapy to heal and trigger tissue repair. This uses ultrasonic peeling to revitalize and deeply cleanse the skin, leaving a brighter, smoother complexion. Caci’s unique Wrinkle Comb will then target fine lines and wrinkles providing a non-invasive alternative to collagen injections with LED light therapy to heal and trigger tissue repair. Target those deep lines and wrinkles, such as crows feet or laughter lines with the Caci Wrinkle comb. This treatment is a non- invasive, needle free alternative to collagen injections and dermal fillers that will instantly plump fine lines and wrinkles from the very first treatment. Get those lips looking luscious. Caci’s award winning amino peptide complex is combined with the wrinkle comb and red LED light therapy to instantly plump the lips and soften lines, typically associated with smoking, giving the perfect party pout. This soothing treatment targets severe acne concerns where exfoliation is not advised. The treatment uses blue and red light therapy (renowned for its anti-bacterial and anti-inflammatory healing properties) combined with the Hydro mask to soothe and calm, as well as reduce redness and irritation. This treatment targets blemishes, age spots and pigmentation. It combines anti-bacterial and anti-inflammatory red and blue LED light therapy to help heal the skin and trigger tissue repair. We use S.P.E.D microcurrent LED technology to enhance results by combining Caci microcurrent high brilliance LED light therapy and ultasonic peeling, or controlled orbital microdermabration, to exfoliate the skin and reveal a brighter, smoother complexion.